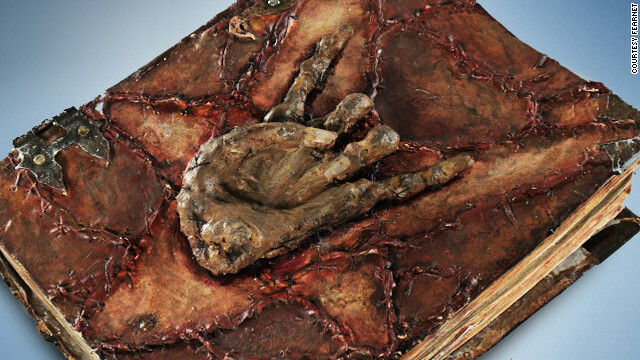 The dastardly, absolutely not good "Book of Pure Evil," from "Todd and the Book of Pure Evil." Print isn’t dead, but it can be deadly. Within popular culture, there exist guides with the express purpose of wreaking havoc and unleashing hell on humanity. While the Kindle, iPad and Nook might have a killer effect on the book industry, these are books that are very industrious at killing. For instance, in the supernatural comedy series “Todd and the Book of Pure Evil” - now in its second season on cable horror network Fearnet - a group of teens at the Satanist-controlled Crowley High battle the forces of a mysterious tome that grants wishes with sinister twists. After witnessing the dark powers of the book and the control it holds over the weak and needy, metal head Todd (Alex House), Jimmy the Janitor (Jason Mewes of “Jay and Silent Bob Strike Back”) and a gang of high schoolers become determined to end the "Pure Evil" plague. The result is a series that has the charm and wit of "Buffy the Vampire Slayer," but with more of a raunchy, at-times awkward humor that appeals to die-hard horror nerds.